Welcome to the seventeenth of the weekly interview series where I will speak a wide range of people who have embraced the working remotely opportunity. We will speak to entrepreneurs, business owners, large organisation workers and freelancers about their trials and tribulations when delving into remote working. This week I am proud to have interviewed Alex Johnson who is a freelance journalist and editorial consultant. Over the last 15 years he has written for a range of national magazines on travel and contributed to a number of travel guidebooks including titles for TimeOut and the AA. I personally discovered Alex’s fantastic work through his famous Shed Working website which is a website very close to my heart. I’ve always been a huge fan of garden based office spaces and Alex perfectly captures some of the best spaces throughout the world on his blog. If you have a spare hour (or ten!) then I suggest you delve into the world of Shed Working. Some of the spaces are literally breathtaking and well worth the time 🙂 To learn more about Alex and Shed Working you can follow his via his twitter account. But how does Alex manage to fit in his time working with the Independent, writing his own books and maintaining his website? I asked Alex about his working from home conditions and his opinions on remote working. Great read! Q: Hi Alex, tell us a little bit about yourself, where are you from, where do you live now? I’m entirely freelance though I’ve been part of The Independent’s online team for about 6 years. When I started working from home there was a lot of this kind of thing but in recent years I’ve found so many other people doing it that I don’t have to explain any more. When I do come across it, I tend to either laugh or point out that statistics show homeworkers do a lot more work than those in traditional offices. Better work-life balance. No commute. Excellent sandwiches. Very much so. It can be hard to turn off from work but the great thing about what I do is that it’s very flexible – of course there are deadlines, but it’s up to me how I hit them rather than having them enforced pointlessly. Crucial, otherwise it wouldn’t work. The family need to realise that working from home is just that, not an excuse to get the homeworker to do lots of chores. Although I write a lot about garden offices and used to work in one, I currently work in the cellar because we moved house not long ago and still haven’t sorted this out (it took ages to get the garden into shape). Again, it’s vital to have a dedicated workspace where nobody can spill orange juice on your laptop or the dog chew through your cables. 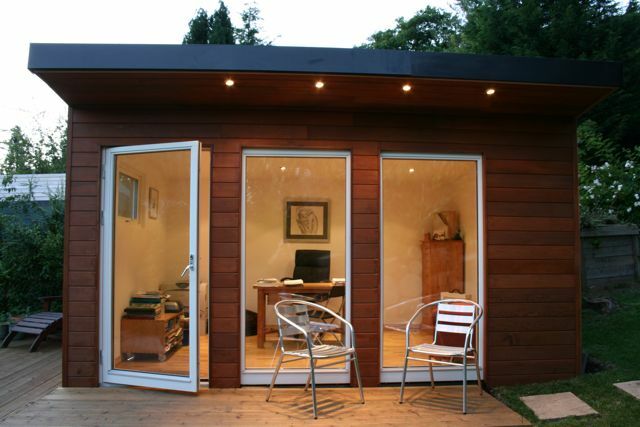 This is why a garden office is perfect. A typical ‘Shed Working’ Office space Alex promotes. Not much of a Shed right? None. I try to answer emails as soon as they come in is about the only thing I do to a plan. Ask yourself if your commute is really necessary.